The Association of Southeast Asian Nations has been alternatively criticized and praised -- as a disparate group in search of meaning, or as a vital regional platform. Long hampered by divided views and the consensus principle, regional leaders have met with mixed results in efforts to overhaul ASEAN's framework. The relentless rise of China, uncertainties ushered in by the Trump administration, a shifting security environment, and international efforts to form a pan-Asian trade grouping are among the many challenges facing regional governments. These issues are of particular concern in Thailand as it prepares to take over the ASEAN chairmanship later this year. In his book Does ASEAN Matter? former Indonesian foreign minister Marty Natalegawa offers a unique insider perspective on the relevance of the 10-member grouping. How can ASEAN deal with big power rivalries and the shifting strategic balance in broader Asia? How can it collectively carve a more meaningful role in relation to the wider East Asia, Asia-Pacific, and Indo-Pacific regions? How can ASEAN harness its resources to contribute more effectively to peace, security, and prosperity in Southeast Asia? What more can ASEAN do to improve the lives of its citizens? Bilahari Kausikan, former permanent secretary at the Singapore Ministry of Foreign Affairs, and chairman of the Middle East Institute at the National University of Singapore. 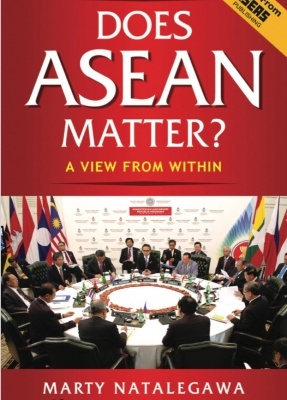 Copies of Does ASEAN Matter? will be available on the evening.